In this increasingly tech-driven world, cyber crimes like data theft, transaction fraud, and malware attacks are growing. As a result, jobs for professionals who know how to defend and secure computer and network systems are also growing--presumably at a rate much faster than other occupations. With a bachelor's in IT security, you, too, can be on the frontline of these 21st-century global issues. Most cyber security programs introduce students to the field through courses on operating systems, scripting and programming, computer forensics, and incident response. As coursework progresses, students may complete assignments and capstone projects by responding to real-world problems with actual companies. Assignments could include writing algorithms for machine-learning applications and/or creating programs to automate processes and improve security measures. Virtually all online bachelor's in network security require students to complete classes in the subjects mentioned above as well as those in digital ethics and technical writing. But other courses vary. For instance, some schools offer a broader degree that will require general education coursework in English, science, and humanities as well as computer science. This is a good choice for someone interested in IT in general. Other programs are heavily focused on computer programming courses and geared not only toward students who already have computer experience, but who are also looking to specialize their careers in a specific programming language or in an area such as homeland security. These more focused programs also give students opportunities to enhance their degree with additional certifications in areas such as ethical hacking or mobile forensics. Pennsylvania State University-World Campus ranks #1 on The 25 Best Online Bachelor's in Network Security Programs! Penn State World Campus offers a BS in security and risk analysis with a concentration in information and cyber security. The 120-credit program requires 45 general education credits, 21 concentration credits, and 39 major credits. Students complete an offsite internship under the supervision of an IT professional. A required course on the threat of terrorism and crime prepares students to identify and track cyber terrorism. Students customize the degree through three elective courses. Online courses are delivered asynchronously, so students can complete coursework at their own pace. Applicants must provide high school transcripts and must have completed an upper-level math course, such as college algebra, analytic geometry, plane trigonometry, or AP calculus. Transfer and military students must submit transcripts from their institutions. Penn State accepts approved transfer credits; students should consult the online transfer course evaluation guide to determine whether their credits are eligible for transfer. Penn State World Campus accepts applications during the fall, spring, and summer semesters. Pennsylvania State University is accredited by the Middle States Commission on Higher Education. Drexel University ranks #2 on The 25 Best Online Bachelor's in Network Security Programs! Located in Philadelphia, Drexel offers an online BS in computing and security technology geared toward working professionals and learners with previous college experience. Drexel's credit for prior learning program awards college credit for certificates in Windows 2008, CCNA, Oracle 9i DBA, and other IT certifications. Drexel offers the fully online BS in 10-week quarters, on a part-time schedule. The online bachelor's degree in network security requires 188 quarter credits comprising coursework in information science, programming, and mathematics. Students select a 27-quarter-credit concentration in computing technology or computing security and complete two quarter credits in either the Drexel experience course or the transfer student seminar. Applicants must submit transcripts, letters of recommendation, a personal essay, and ACT or SAT scores. Applications are accepted on a rolling basis. Students can apply up to 113 transfer quarter credits toward the degree. Drexel charges per-credit tuition rates and offers discounted tuition for military members and alumni. Drexel maintains partnerships with hundreds of corporations and offers discounted tuition rates to their employees. Online students are eligible for financial aid. Drexel University is regionally accredited by the Middle States Commission on Higher Learning. Old Dominion University ranks #3 on The 25 Best Online Bachelor's in Network Security Programs! Based in Virginia, ODU offers an online BS in cybersecurity. The 120-credit-hour, interdisciplinary program includes coursework in cybersecurity foundations and applications. Students work with an advisor to arrange an internship at an offsite location. ODU delivers online courses synchronously and asynchronously. During synchronous courses, distance learners use web conferencing to participate in lectures streamed live from campus. Each student works with an advisor to plan their degree track. ODU offers rolling admissions and has guaranteed admission agreements with Virginia community colleges. Associate degree holders transferring from a community college to ODU must have a cumulative 2.5 GPA and must submit a letter of intent. Applicants must also submit an activity resume, high school and/or college transcripts, SAT or ACT scores, letters of recommendation, and a 400-word essay. In-state students pay discounted, per-credit-hour tuition rates. Military students can complete courses using DVDs. Most online programs follow the ODU semester schedule, but some courses are available in accelerated eight-week terms. Old Dominion University is accredited by the Southern Association of Colleges and Schools Commission on Colleges. Liberty University ranks #4 on The 25 Best Online Bachelor's in Network Security Programs! Located in Virginia, Liberty offers an online BS in information technology with a concentration in data networking and security. IT students complete 48 credit hours of core coursework, and the data networking and security concentration comprises 15 cognate hours. Students can choose to complete an optional, three-credit-hour internship. As a Christian university, Liberty requires students to complete coursework in Christian life and thought competency. Full-time students typically complete the program in four years. The fully online program requires 120 credit hours, and Liberty accepts up to 90 hours of transfer credit. Liberty maintains transfer agreements with Virginia and North Carolina community colleges, enabling associate degree holders to transfer easily into Liberty's bachelor's degree in network security program. Liberty awards credit for military training, professional certificates, and experiential learning. Online courses are delivered in eight-week subterms. Full-time students take 12 credit hours per semester, and part-time students complete 6–11 credits per semester. Liberty charges per-credit-hour tuition rates, which differ by enrollment status. Students pay course fees for software licensing. Liberty University's BS in information systems is accredited by the Accreditation Council for Business Schools and Programs. 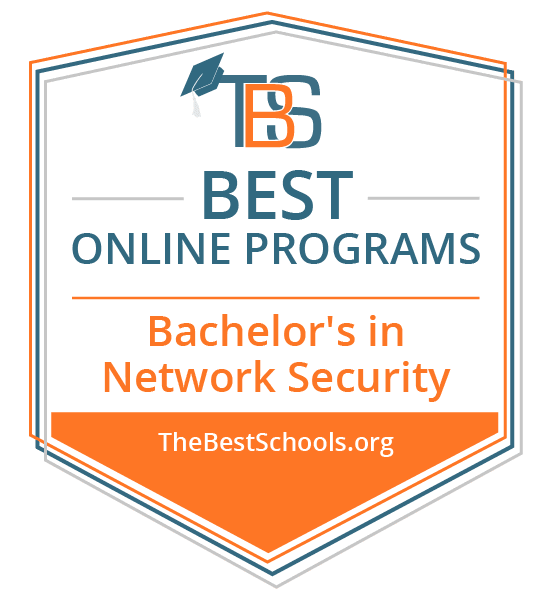 City University of Seattle ranks #5 on The 25 Best Online Bachelor's in Network Security Programs! CityU, designated a National Center of Academic Excellence in Cyber Defense Education by the National Security Agency and the Department of Homeland Security, offers an online BS in cybersecurity and information assurance. CityU's 180-credit bachelor's in network security requires 45 credits of core coursework in governance, risk management, and compliance. Classes emphasize legal and ethical components of cybersecurity. Students also complete 40 credits of cybersecurity technology coursework, 10 elective credits, and a five-credit capstone requirement in bureaupathology, during which students use case studies to explore the pathologies within organizations. Students can accelerate the program to graduate within two years. CityU delivers courses in five- and 10-week terms. Students earning the online bachelor's degree in network security participate in virtual classroom sessions through Blackboard. Some courses require campus visits. CityU uses assessments to award credit for prior learning. The university accepts applications on a rolling basis. Applicants must submit transcripts, an online application, and an application fee. Military members and their spouses are eligible for discounted tuition rates. CityU charges per-credit tuition rates. City University is accredited by the Northwest Commission on Colleges and Universities. Excelsior College ranks #6 on The 25 Best Online Bachelor's in Network Security Programs! Located in Albany, New York, Excelsior College offers an online BS in information technology with a concentration in information security. The program also offers concentrations in cybersecurity and network operations. The 120-credit bachelor's program requires an integrated technology capstone, an arts and sciences component, information technology coursework, and free electives. Students gain skills in network security, computer forensics, and cryptography. Graduates understand their professional, ethical, and social responsibilities as IT professionals and possess expertise in core information technologies. Online courses follow 15-week trimesters, separated into eight-week subterms. Each course is organized into learning modules. Excelsior provides online resources including library access and a writing lab. Along with transfer credit, Excelsior awards credit for military training, professional certificates, and prior knowledge. Excelsior maintains partnerships with organizations, including the military, to provide reduced tuition rates. Prospective students apply directly to the network security degree online program. Excelsior College's BS in information technology is accredited by the Computing Accreditation Commission. Champlain College ranks #7 on The 25 Best Online Bachelor's in Network Security Programs! Champlain's online bachelor's degree in cybersecurity received honors from the United States Air Force Office of Special Investigations and the Department of Homeland Security. The fully online cybersecurity degree requires 120 credits, including 72 credits of professional courses and 48 general education credits. The program awards both a bachelor's degree and certification in cybersecurity. Students earning the network security bachelor's degree complete five specialization courses, including digital forensic investigation techniques and ethical hacking. Students complete courses asynchronously during 15-week semesters. Part-time students pay per-credit tuition rates, and full-time students pay a flat tuition rate. Champlain offers career services, including interview preparation and assistance securing internships. Applicants must submit high school and/or college transcripts, a short essay, and a resume. Transfer applicants can bring up to 90 previous credits. Applications are accepted on a rolling basis, with six start dates per year. University of Illinois at Springfield ranks #8 on The 25 Best Online Bachelor's in Network Security Programs! Designated by the National Security Agency as a National Center of Academic Excellence in Information Assurance Education, UIS offers an online BS in information systems security degree completion program. The bachelor's in network security program requires 120 credit hours, including 37-40 general education credit hours. Major coursework comprises up to 61 hours of the curriculum, and students complete a 10-hour engaged citizenship common experience. The systems security and information assurance capstone examines the eight security domains of the CISSP. UIS delivers online courses through Blackboard. UIS accepts applications for the spring and fall semesters. Applicants must submit a statement of purpose and must have at least 30 college credit hours, a 2.0 undergraduate GPA, at least two semesters of experience with Java programming, and one completed upper-level math course, such as calculus or statistics. Accepted students must complete a computer science assessment test. UIS is accredited by the North Central Association of Colleges and Schools. Kennesaw State University ranks #9 on The 25 Best Online Bachelor's in Network Security Programs! Based in Georgia, KSU offers a bachelor's of business administration in information security and assurance. KSU's bachelor's degree in network security is recognized by the Department of Homeland Security and the National Security Agency. Full-time students typically complete the 126-hour program in four years. Students complete 42 general education hours and 18 hours of major coursework. Students with fewer than 15 hours must complete the first-year seminar. Transfer students with at least 30 previous credit hours and a cumulative 2.0 GPA can submit credit hours for transfer approval. KSU awards prior learning credit for military training and professional certificates. Online courses follow 15-week semesters with seven-week subterms. KSU charges a per-credit tuition rate for online courses; however, eCore and eMajor courses, offered through the University System of Georgia, are billed at a different rate. KSU offers online resources including academic tutoring. Online courses are delivered through the Brightspace Desire2Learn platform. Although some distance education courses are offered fully online, most require one in-person meeting per semester. Online students can use an off-campus proctor for exams. KSU is regionally accredited by the Southern Association of Colleges and Schools Commission on Colleges. Southern New Hampshire University ranks #10 on The 25 Best Online Bachelor's in Network Security Programs! SNHU offers an online BS in information technologies with a concentration in cyber security. The 120-credit program includes 45 general education credits and a three-part capstone. The capstone comprises a lab-intensive course in advanced information systems design, an advanced information systems implementation course, and the creation of a program portfolio. To complete program requirements, students must install Adobe, GameMaker, ArcGIS, and Cypherpath on their computer. SNHU offers discounted tuition rates for military students and provides a warrior transition technology training program that prepares military members for IT careers by covering certification fees and teaching interviewing skills. The bachelor's program is delivered in eight-week terms, with start dates throughout the year. SNHU awards credit for IT certifications. Applicants must submit high school and/or college transcripts and an attestation form confirming high school graduation. Davenport University ranks among The 25 Best Online Bachelor's in Network Security Programs! Located in Grand Rapids, Michigan, Davenport offers a BS in cyber defense recognized by the Department of Homeland Security and the National Security Agency. The bachelor's degree in network security teaches students to protect data. The program offers specialties in healthcare information and assurance, information assurance, or mathematical modeling. Students complete 30 credits of general education coursework in areas such as advanced composition and statistics. The curriculum includes 10 credits of business coursework and 15 credits of cyber defense coursework, which covers topics such as database design and network security. Students also complete 45 major credits, including a capstone and an internship. The capstone involves a tech project and a certification exam, and the internship requires 200 hours of work experience. During an optional field experience course, students develop live projects for companies. Applicants must submit high school transcripts, SAT or ACT scores, and placement exams to assess reading, writing, math, and computer skills. Davenport maintains articulation agreements with several in-state and out-of-state community colleges. Davenport University is accredited by the Higher Learning Commission. Bellevue University ranks among The 25 Best Online Bachelor's in Network Security Programs! Based in Nebraska, Bellevue offers an online BS in cybersecurity. The 127-credit-hour curriculum includes 55 hours of electives and 36 hours of major courses. The bachelor's program is also available in an accelerated, cohort-based format. Students on the traditional, semester-based schedule complete the program in four years; accelerated students graduate in two to three years. Applicants to the accelerated program must have at least 60 previous credit hours or an associate degree from an accredited institution and must pass an academic readiness assessment. Traditional and accelerated students pay the same per-credit tuition rate. All applicants must submit official transcripts. Bellevue maintains transfer agreements with community colleges across the nation and awards credit for military training. Bellevue participates in the Yellow Ribbon Program, which provides additional funding for military members. Each student is paired with a student coach, who acts as an academic advisor. Bellevue University is accredited by the Higher Learning Commission. Western Governors University ranks among The 25 Best Online Bachelor's in Network Security Programs! Incorporated in 1997 as a nonprofit online school based in Salt Lake City, Utah, Western Governors University provides expanded educational access without boundaries. Affordable and student-centered, WGU maintains a strong reputation in distance learning and flexible, competency-based education. WGU's bachelor of science in network operations and security permits students to set their own study pace, regardless of semester schedules, credits completed, or typical class start times. Students may take proctored assessment tests via webcam when ready, while those who prefer more structure may also elect to join a cohort. Subject material for the bachelor's in network security includes operating systems, programming, data management, web development, and cloud foundations. Students complete 35 courses and a written capstone project addressing a relevant industry problem. The program also covers background material for 14 respected industry certifications, often enabling students to attract employer interest before graduation. Western Governors University offers individualized assistance for all students through an assigned program mentor and provides alumni support after graduation. With an emphasis on value delivered through return on educational investment, WGU aims to graduate students who carry little to no student debt. Women, active duty, and retired military students may qualify for specialized scholarship opportunities. Distance learners typically complete a minimum of 12 competency units, or three to four classes, in the course of each six-month term. The majority of candidates graduate within six to 36 months. WGU is regionally accredited by the Northwest Commission on Colleges and Universities and occupies a unique position in holding accreditation from four regional commissions. University of Maryland-University College ranks among The 25 Best Online Bachelor's in Network Security Programs! Founded in 1847 and based in Adelphi, Maryland, the University of Maryland - University College specializes in providing affordable and practical career education for busy professionals. UMUC's student-centered mission and values emphasize educational access, diversity, and integrity. Students also have the option to choose a hybrid course at one of UMUC's 20 campuses across the U.S.
UMUC offers a 120-credit bachelor's degree in software development and security. Courses are taught in eight-week sessions and students must complete 46 elective credits. Courses in the network security degree cover how to detect software vulnerabilities, secure programming in the cloud, current trends in computer science, and database security. All courses are available online and are taught asynchronously. Students may also select a hybrid option in which classes meet both in person and online. Open educational resources, immediately accessible and provided at no additional cost through online classrooms, eliminate the need for textbook purchases. Professors assess students through projects and papers, which take the place of traditional exams in most UMUC classes. Transfer students may take advantage of the school's generous transfer credit policy, with up to 90 transfer credits accepted for eligible coursework. Eligible students may also receive credit for exams, military training, professional certifications, and other prior work and life experience. The school maintains a rolling admissions deadline, with many potential start dates offered each semester. Saint Leo University ranks among The 25 Best Online Bachelor's in Network Security Programs! Founded in 1899 and located in Saint Leo, Florida, Saint Leo University is a Catholic school rooted in the Benedictine tradition. An early adopter of online education, the school's online programs began in 1998. Today, Saint Leo boasts 35 teaching locations and focuses on affordability, responsible stewardship, and balancing growth in mind, body, and spirit. Saint Leo's bachelor's in cybersecurity program consists of 121 credits, including four credits of electives, and all classes may be completed online. Designed to prepare students for entry level employment in cybersecurity, the program stresses the fundamentals of penetration testing, protection protocols, implementation and maintenance of security systems, and ethical hacking. Required coursework for the bachelor's degree in network security includes computer forensics, disaster recovery, and homeland defense. Students work in an immersive virtual lab, and use software tools to handle realistic simulated security situations within the context of mock IT infrastructure. Professional development opportunities include internships and membership in the Upsilon Pi Upsilon international honor society. Noted as one of the nation's most military-friendly institutions, Saint Leo maintains a veteran student services office and partnerships with military projects supporting education. The school's articulation agreements with over 40 U.S. community colleges allow students to easily transfer previously earned credits. Eligible students with associate degrees from regionally accredited schools may transfer up to 64 credits and might also receive credit by exam in recognition of previous work, service, or learning experience. Saint Leo is regionally accredited by the Southern Association of Colleges and Schools Commission on Colleges. Dakota State University ranks among The 25 Best Online Bachelor's in Network Security Programs! Founded in 1881 and based in Madison, South Dakota, Dakota State University specializes in computer information systems and management. With continued emphasis on computer technology and rigor in learning and teaching processes, the school boasts a high job placement rate for its graduates. Coursework for Dakota State University's bachelor's in network and security administration includes advanced routing and switching, operating environments, business management, database management systems, and web application programming. Featuring small class sizes of 25 or fewer students, DSU offers virtual and physical labs for students to experiment with network setup, configuration, defensive hacking, and forensics using enterprise hardware, such as routers, switches, and firewalls. Outstanding students may qualify for the Fast Track program. The school also offers a two-year associate degree in network and security administration. All credits earned through the associate program apply toward the bachelor's degree. As an example of DSU's community centered approach, online courses are often taught concurrently with on-campus courses, enabling online and on-campus students to learn and complete projects collaboratively. Instructors also maintain partnerships with industry leaders to provide field internships. A self-support rate applies to payment of tuition and fees, so distance learners only pay for credit hours taken and services actually used. Full-time students also receive laptop computers. Students interested in government security careers, who can study full time on campus, should note that DSU offers an attractive scholarship program that covers all tuition and fees. This scholarship includes a generous stipend for up to 10 students annually. The program also features an internship and guaranteed job offer after graduation. DSU is regionally accredited by the Higher Learning Commission. Lewis University ranks among The 25 Best Online Bachelor's in Network Security Programs! Founded in 1932, Lewis University upholds the Lasallian tradition to inspire others through education. This liberal arts school is based in Romeoville, Illinois. The school's accelerated bachelor of science in information security and risk management combines management studies, technological skill development, and a focus on ethical issues in information security. Preparing students for industry certifications, coursework includes risk management, ethical hacking, computer forensics, and disaster recovery planning. The school's cloud-based lab environment is available online 24/7, allowing students to connect to virtual machines and complete hands-on hacking, forensics, database management, and programming coursework from any location. New fully online sessions begin every five to eight weeks. Distance learners in this program enjoy access to scholarships provided by defense agencies of the federal government exclusively for university students. Lewis University's transfer policy offers up to 30 credit hours for previous learning and work experience, and special grants and scholarships are available to eligible transfer students. Adult learners and employees at Diocese institutions are eligible for discounted tuition rates. Students interested in extending their studies to earn a master's degree in information security can enroll in the fast-track option, enabling them to complete the master's degree in 18 months with 26 additional credits beyond the network security bachelor's degree, rather than 35-41. A fast-track MBA option enabling 30 credits rather than 36-54 is also available to students who plan accordingly. Lewis University is regionally accredited by the Higher Learning Commission. Charter Oak State College ranks among The 25 Best Online Bachelor's in Network Security Programs! Established in 1973 and located in New Britain, Connecticut, Charter Oak State College is a public college offering courses exclusively online. Charter Oak strives to provide students with alternative and affordable means to earn degrees through many forms of achievement. Charter Oak State College's bachelor's program in cyber security consists of 120 credits, beginning with a three-credit cornerstone seminar and concluding with a capstone. Designed for students with a background in computers and an aptitude for information technology, the well-rounded curriculum includes auditing IT infrastructure for compliance, cyberwarfare, digital forensics, cyber policy analysis, information systems risk management, and legal issues in information security. The school also offers college credit for certified information systems security professionals. Since Charter Oak offers coursework exclusively online, its structure suits the needs of distance learners. Academic advising, free tutoring, library services, career services, and alumni networks are all readily available online. Admission is open to anyone 16 years of age or over who has earned nine approved college level credits. Boasting a generous transfer policy, Charter Oak accepts up to 87 transfer credits, and maintains reciprocity agreements with institutions in other states to standardize distance education coursework. Eligible students may also receive college credit for portfolio assessments, lifelong learning, standardized tests, licenses and certifications, military and corporate training, and credit by exam. Charter Oak is regionally accredited by the New England Association of Schools and Colleges and by the Connecticut Board of Governors for Higher Education. Wilmington University ranks among The 25 Best Online Bachelor's in Network Security Programs! Chartered in 1968 with its base in New Castle, Delaware, Wilmington University is a private, nonsectarian, open access institution. Focused on career preparation and advancement, the school offers affordable tuition rates and admissions policies tailored toward improving access for all. Designated as a nationally recognized center of academic excellence in cybersecurity by the federal government, Wilmington's bachelor's program in computer and network security meets rigorous standards in an emerging field. Comprised of 120 credits, core courses combine information technology with legal studies and criminal justice. Coursework includes cryptography algorithms and applications, data integrity and disaster recovery, programming in Python, and firewall and perimeter security. The program also helps prepare students to obtain recognized industry certifications. A military friendly school, Wilmington offers college credit for military training, and active duty military students receive a tuition discount. All students pay in-state tuition, regardless of location. Eligible transfer students may receive up to 90 credits in transfer. Students who have completed two core courses in residence and 60 credits with a minimum GPA of 2.5 may also elect to complete an individually designed cooperative assignment involving six credit hours of approved relevant work experience. All courses are delivered entirely online through the Blackboard learning platform, no on-campus meetings are necessary. Distance learners may enroll in online classes by semester (15 weeks) or by block (seven weeks). Students may also select a hybrid option that combines classroom time with online coursework. Wilmington is regionally accredited by the Middle States Commission on Higher Education. Robert Morris University - RMU Online ranks among The 25 Best Online Bachelor's in Network Security Programs! Founded in 1921, Robert Morris University's main campus is located in Moon Township, Pennsylvania. With a global perspective and a focus on engaged learning and well-being, the school offers distance learners a high level of support and individualized attention. RMU's fully online bachelor's in cyber forensics and information security combines law, business, organizational behavior, and technology. Distance learners complete 123 credits, including 15 restricted elective credits in an approved area of interest and 21 open elective credits. With an emphasis on global perspectives and a proactive, supportive environment of engaged learners, coursework for the school's online bachelor's degree in network security includes digital evidence analysis, cyberlaw, a selection of programming languages, such as Java, Visual Basic, and C++, and mobile forensics. An annual two-week seminar on national security and a study abroad option provide students with an opportunity to gain hands-on work experience at the forefront of the field. Online students receive direct personalized assistance through a student services representative, a financial aid counselor, a wellness counselor, a dedicated career advisor, and around-the-clock technical support. RMU maintains a rolling admissions deadline, affordable tuition, flexible payment plans, and generous benefits policies for military veterans. All students and alumni may take advantage of available services through the school's career and professional development center. Other benefits include a parent and sibling tuition discount and a corporate tuition discount for employees of selected organizations and professional associations. Robert Morris University is regionally accredited by the Middle States Commission on Higher Education. Mercy College ranks among The 25 Best Online Bachelor's in Network Security Programs! Based in Dobbs Ferry and the New York City area, Mercy College is a private, nonsectarian school with a mission to provide access to first-generation college students in financial need who are demographically underrepresented in higher education. Founded in 1950, Mercy College boasts a diverse student population, a multifaceted wellness initiative, and a commitment to affordability. Mercy's bachelor's program in cybersecurity consists of 120 credits, including coursework in cryptography, penetration testing and ethical hacking, and forensic electronic discovery. Students complete 12 credits of electives, such as artificial intelligence, systems analysis and design, and cybersecurity field experience. Interested students may apply their studies to prepare for the certified information systems security professional exam. A dual degree program in cybersecurity is available to outstanding students interested in leadership, offering the opportunity to complete both bachelor's and master's degrees in just five years. Applications for the dual degree option must be completed during the student's junior or senior year. Up to 90 credits are accepted in transfer, with a maximum of 75 credits from two-year schools. Full-time students can complete the program in four years. With a rich history of community service, Mercy College offers many service learning opportunities and international travel opportunities. It boasts affordable tuition rates and is recognized as a yellow ribbon school for veterans. Mercy College is regionally accredited by the Middle States Commission on Higher Education and is recognized as a center of academic excellence in cyber defense by the National Security Agency and the Department of Homeland Security. Franklin University ranks among The 25 Best Online Bachelor's in Network Security Programs! With more than 25 locations in the midwest, Franklin University is a Columbus, Ohio-based nonprofit institution of higher learning. Serving ambitious working students since its founding under YMCA sponsorship in 1902, Franklin also maintains co-locations at regional partner community college campuses to facilitate completion of bachelor's degrees. Designed for busy working professionals, Franklin's fully online bachelor's degree in cyber security focuses on management, policy, programming, database systems, and networks. Students complete 124 credits of coursework, including security risk management, information systems architecture and technology, disaster recovery, and software development security. Students also develop risk assessments, penetration tests, vulnerability scans, security plans, and complete a required capstone to integrate learning outcomes. For admissions purposes, students may demonstrate proficiency through placement tests. Franklin's transfer-friendly policies allow distance learners to transfer up to 94 credits, and eligible students may accelerate their education through college credit for proficiency exams and for military, professional, or vocational training. Recognized as a military-friendly school, Franklin provides a generous half-price tuition discount for active duty service members. Military scholarships, survivors and dependents assistance, and up to 15% off tuition for spouses and dependents is also available. Distance learners may take advantage of workshops, scholarly information, testing services, research consultation, structured learning assistance, and tutoring through Franklin's learning commons. Flexible scheduling allows students to choose from several start dates throughout the three-trimester academic year. Most students complete the degree in just under four years. Franklin is regionally accredited by the Higher Learning Commission. Capitol Technology University ranks among The 25 Best Online Bachelor's in Network Security Programs! Established in 1927 and based in Laurel, Maryland, Capitol Technology University boasts a strong commitment to providing focused education and training for professional employment in business, computer and information sciences, and engineering. As a member of the Maryland Green Registry, the school demonstrates its commitment to fostering environmental sustainability with a variety of green initiatives. Capitol offers a bachelor's degree in cyber and information security comprised of 120 credits, including 18 elective credits. The program's primary goal is linking students' professional aspirations to employment opportunities. Core coursework includes applied wireless network security, incident handling and malicious code, and malware analysis and reverse engineering. Coursework prepares students for certification exams, enabling them to gain credentials before graduation. The school's Cyber Lab provides a realistic demonstration environment for attack simulations, where students learn to detect, analyze, and defeat these attacks. The school holds an impressive job placement record, with many students in the network security program receiving offers of employment before degree completion. Uniquely, Capitol offers a job guarantee, boasting that students who graduate with a qualified bachelor's degree will find employment in the field within 90 days of graduation. If not, the school provides up to 36 additional credits at no charge while the student's job search continues. Eligible distance learners may transfer up to 70 semester credits from community colleges, military coursework, professional certifications, credit by exam, and advanced placement courses. Capitol is regionally accredited by the Commission on Higher Education of the Middle States Association of Universities and Schools. University of Maine at Fort Kent ranks among The 25 Best Online Bachelor's in Network Security Programs! Founded in 1878 and located in the St. John Valley at the international intersection of Maine, New Brunswick, and Quebec, the University of Maine at Fort Kent is a public rural school with a focus on the unique challenges of serving rural areas in the U.S. Boasting affordable education with a global perspective, the school provides individual support, fostering a community-driven scholastic atmosphere and a creative work ethic. UMFK offers an interdisciplinary online bachelor's degree in cybersecurity and information security. Integrating knowledge from economics, psychology, and management, this respected program emphasizes protection of and preservation of technological infrastructures. Designed to serve as a conduit to professional employment in the field, coursework for the program includes information assurance policy, cryptography, Java programming, operating systems security, and computer ethics. Students may also elect to complete an internship. All students complete an integrative cybersecurity portfolio to assess overall learning outcomes and academic growth. Learners can also earn an associate degree, a minor, or a certificate in information security. In keeping with its focus on bridging society, management, and technology, the University of Maine at Fort Kent also conducts outreach to community organizations and K-12 level schools. It also maintains a variety of collaborative research partnerships within the industry and government. Current and former military students and their dependents may be eligible for in-state tuition. UMFK is regionally accredited by the Commission on Institutions of Higher Education and is recognized as a distributed center of academic excellence in information assurance and cyber defense by the National Security Agency and the Department of Homeland Security. Peirce College ranks among The 25 Best Online Bachelor's in Network Security Programs! Since its founding in 1865 in Philadelphia, Pennsylvania, Peirce has focused on practical skills and career education. The school's mission centers on affordability, personal attention, and flexible classes for working people. Peirce offers a BS in information technology with a concentration in networking, administration, and information security. Distance learners complete the online network security degree in a self-paced, competency-based education format that consists of a minimum of 121 credits, including 12 credits of electives. Eight-week core courses include ethical management of information technology, usability principles and design, server administration, and an integrative capstone. Since the coursework also aligns with professional certification requirements, students may opt to sit for certification exams before graduation. Peirce Fit is the school's unique, flexible educational approach that permits students to choose whether to attend class on campus or online each week. The school maintains rolling admissions, with frequent start dates and a generous transfer policy of up to 90 credits. Credit may also be granted by examination, for military training experience, or for industry standard certifications. In keeping with its roots as a college for soldiers who served in the civil war, Peirce offers benefits to military students, spouses, and dependents, with a 25% tuition discount. These applicants may also be eligible for special military-only scholarships. Distance learners may take advantage of free online tutoring services and receive discounts on laptops and internet access. Peirce is regionally accredited by the Middle States Commission on Higher Education. Today, just about every business imaginable is connected to the internet and uses computers to communicate and track and store data, which means ample opportunities for network security experts exist. Whether you want to work for yourself, be a part of a team, or be the person responsible for a department, there are multiple roles and responsibilities open to IT professionals with an online network security degree. Network and Computer Systems Administrator: Network system administrators are experts in hardware and software needs. They use their knowledge to design, upgrade, test, and maintain computer system software and hardware for maximum efficiency and security. Administrators with graduate degrees often supervise a team of computer specialists who troubleshoot problems and provide technical assistance when needed. Information Security Analyst: Information security analysts are responsible for protecting companies from data theft and cyber attacks. They monitor networks for security breaches, investigate incidents, and develop and maintain security features such as encryption programs and firewalls. People who do well in this position often advance into upper management roles after earning a master's degree. Network Architect: Network architects design and implement data communication networks with information security in mind. They are required to stay on top of the latest technologies in order to upgrade hardware and software that will improve system performance and meet a company's specific computing needs. Because network architects work closely with a company's business management team, many companies look for candidates with an MBA in computer security.